Delicious Hakata ramen near Hiroshima Station’s shinkansen exit. Ramen is taken very seriously in Fukuoka/Hakata, much like okonomiyaki is here. 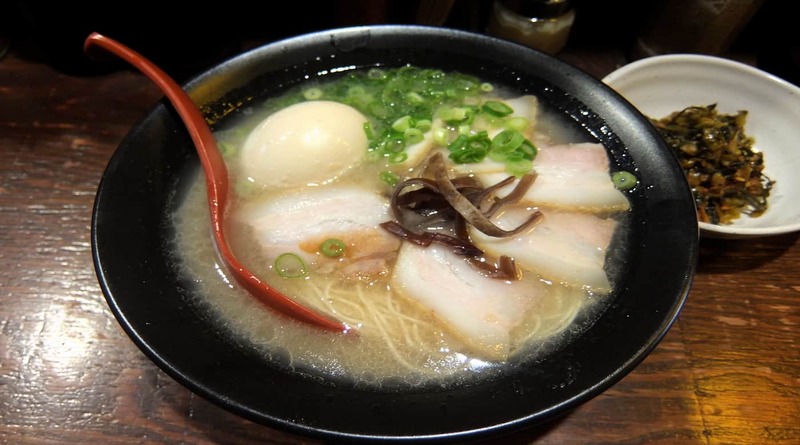 Ton-kotsu (pork based) is the only type to eat in Hakata. Outside the region shops tend to go with a thicker, oilier kotteri soup which is easier to make, but Michimaru’s broth is the delicate, and difficult to master, light assari broth. Noodles here have a different texture than most ramen, as they are Kyushu style. You can choose your noodle firmness as you would there. I tend to opt for the kona-otoshi literally “still dusty with powder”, extremely firm noodles, but if you aren’t specific, you’ll be fine. Near the station, Michimaru is as good as Fukuoka, and cheaper than getting on the shinkansen.